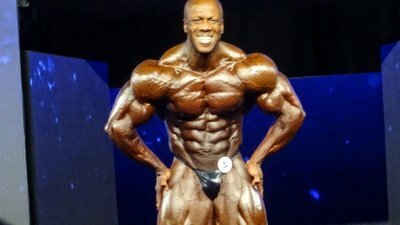 I was there when Shawn Rhoden, at age 43, called his Mr. Olympia victory. It was a typical sunny, energy-filled Sunday afternoon at Gold's Gym, Venice. I had made the 28-mile excursion from Pasadena to the Mecca to meet up with Bill Comstock, the noted photographer and videographer, to record "The Swami's" 2018 Olympia predictions. Other than Dexter Jackson being put through a tough training session under the watchful eye of Charles Glass, no other Olympia competitors were in sight. After finishing the taping about 20 minutes later, I see a big dude, fully clothed in thick sweats, chilling on a stationary bike. Shawn Rhoden was in the house. "I thought you were living in Santa Barbara these days," I said. "I told my wife I had to train the last month here at Gold's," Rhoden calmly responded. "I'm 262 pounds right now and am already in excellent shape. This is the year I am going to win the Olympia." It wasn't said with arrogance, just simple confidence. "Everyone talks about Phil Heath's back double biceps shot, but that's only one pose," Rhoden said. "I'm wider, with a much smaller waist, and I will be dry." I didn't doubt the sincerity of what Rhoden was saying, but honestly, every top competitor needs to feel pretty much that way going into the show. And I didn't have the visuals to back it up…yet. Fast forward four days. I needed to return to Gold's on Thursday to add to the video. After finishing, I was walking out of the gym when Chris Lewis, who is part of Rhoden's training team, came up to me and said, "I want you to take a look at Shawn. You've got the eye, and I respect your opinion." I viewed Rhoden going through the mandatory poses. In a word, I was astonished. I mean, it was still 21 days before game day, and I thought he could step onstage that weekend. He looked so sublime, in fact, I told Comstock on the way out of the facility that I truly believed Rhoden could become only the fourteenth bodybuilder to don the Mr. Olympia crown. I had already turned in my Olympia predictions to Bodybuilding.com, and the video was also completed, so no changes were made. I had him in the top six, but not beating Heath, and probably coming in behind Big Ramy and possibly Dexter Jackson as well. And I knew right at that moment that I very well might be wrong. And, as we all know by now, The Swami was off his game on this one, thanks mostly to the brilliant performance of Rhoden. The irony of the Rhoden victory? He slipped to fifth in 2017 after a second place finish the year before. I might have been the only person impressed with that. Why? Because he suffered a broken jaw during the off-season and was drinking his meals out of a straw. Not to mention being out of the gym for 12 weeks. And earlier this year, he missed the Arnold Classic while dealing with ulcers that put him in the hospital. So, I figured, if he could still make the top five under those circumstances, he could definitely have a good shot at winning in 2018. Remember, Rhoden was third in both 2014 and 2015 as well, so it's not like he had never joined the party. And plenty of diehard fans of the sport have preferred his physique over the eventual Olympia and Arnold Classic winners in recent years. When you consider all that, Rhoden's win should not have been considered a major upset. His nickname is "Flexatron," but I have always referred to him as the modern-day Flex Wheeler because of his marvelous lines, set off by what must be a 28 or 29-inch waist. His muscle separation, abs, his balance—everything about Rhoden's physique is world-class, and the conversation in Las Vegas and online were rightfully focused on that. So no, to be clear, his victory isn't a fluke. This isn't a case of Heath "losing" the crown; Rhoden won it, because he took the time, did the work, and was the right choice on the right night. So now, the Jamaica-born Rhoden, who was about 250 pounds on a 5-foot-10 frame at showtime, has put his mark in the record books. At 43, he tied Chris Dickerson as the oldest competitor to win the Olympia. And, people may not know, this is a man who lost his class at the NPC Team Universe in 1999, 2000, and 2001. Talk about paying your dues. He's competed 40 times on the pro ranks, and his competition career spans two decades. No Johnny-come-lately here, folks. But, now that he completed that long, winding journey from amateur to the best in the world, don't think his age will deter him from continuing to refine his physique. "My coach, Chris Aceto, told me to just concentrate on my training, not worry about what others were saying or doing," Rhoden said after his victory. "Just stay in your lane. If you show up at your best, nobody will beat you." Four-time Mr. Olympia Jay Cutler also lent Rhoden some words of wisdom. "Jay told me back in 2012 if you want to be Mr. Olympia, you have to talk like Mr. Olympia, walk like Mr. Olympia, train like Mr. Olympia before you become Mr. Olympia. So, that I tried to do." You follow instructions well, my man. Very well! Rhoden learned from the best, and now he is the best.